It's been a long time since I took a real vacation. So i decided to take this week off. I truly did nothing except for sleeping, resting and watching TV except for a fashion event this Wednesday. I was watching the boom tube for hours, between naps ofcourse. I saw I Love Lucy, Little House on the Prairie, Who's the Boss, Wonder Woman, Bewitched, I Dream of Jeannie, Star Trek, Family Matters and The Nanny just to mention a few. 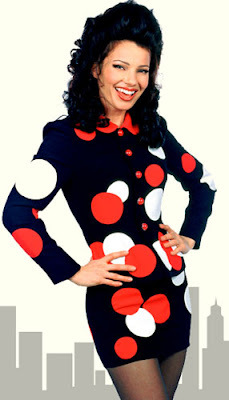 I love Fran Drescher (Miss Fran Fine) besides being the fashionista that she was and oh so wacky; she had wonderful taste in men ( I hate you girl). To start off their were 6 seasons, between laughter, tears, food and screw ups, the MEN were gorgeous (well not all). I'll mention the ones I can remember in no particular order. The first Danny, her fiancee, who was stupid but cute, then Phillipe-the French Tutor, Steve-the Stowaway, David-Waiter at the Russian T-room, Kurt-the Male Nanny, Brock Storm-the Actor, Nigel-Max's brother, Glen-the Hot Dog Vendor, Joshie-at the Kubitz, Mike LaVoe-Hockey Player, Gary-the Cantor, Steve-the Funeral Director; there were more including Erik Estrada who's out of gas. At least she had some fun while she waiting for Max Sheffield. I myself would have picked from this group. If it were me, these would have been my top five. 1-Phillipe (Tutor), 2-Nigel (Max Brother), 3-Steve (Stowaway), 4-Gary (Cantor) and finally Steve (Funeral Director).